After you’ve had a new floor installed or an existing floor refurbished, there are a couple of things you need to know about the ongoing care of your floor. By following just a few basic procedures, it is possible to vastly extend the life of your floor. After all, wood floors don’t come cheap so it certainly won’t hurt to take some precautionary measures. In this article, we’ll discuss some common maintenance methods as well as a few preventative measures you can take to keep your floor in great shape. This may seem like a no-brainer, but keeping your floor clean and especially keeping it free from grit will do wonders for maximising longevity. There are a couple of ways you can go about cleaning your floor, but it’s also important not to over clean your floor as certain floor cleaners can break down the floor finish, resulting in faster wear. The floor finish you choose also makes a difference in the recommended method of cleaning, so these will be discussed separately. Oil based finishes act quite differently to lacquer finishes. The oil based finish most frequently used in the United Kingdom is Hardwax oil. Hardwax oil, as the title describes, contains both wax and oil. The oil component penetrates the wood and protects the wood from within, giving the timber a very rich colour. The wax component forms a water-resistant seal, and provides the surface with a matt sheen. When choosing a floor cleaning product for flooring sealed with a Hardwax oil, it’s important to choose a non-detergent based product. Some floor cleaners may contain a hint of bleach or other aggressive cleaning agents, which is not what you want in this case. Our recommended floor cleaning product is manufactured by a company called Osmo. 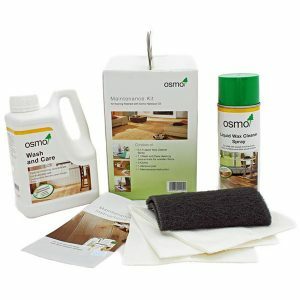 Osmo’s range of flooring products really are fantastic and they also have a handy floor cleaning kit. Before mopping your floor, remove any dust or grit with a vacuum cleaner. Next, clean the floor with a damp mop only. Don’t soak the floor with water as this may leave marks and any residual water may seep in-between the joins. Lacquer (in most cases water-based polyurethane) provides a somewhat more durable finish in comparison to Hardwax oil, but it’s still important to follow the correct maintenance routines. Water-based polyurethanes form a protective seal on the surface of the wood. The sealant doesn’t penetrate the wood, but rather forms a protective layer on the outside. Similarly to Hardwax oils, water-based polyurethanes can break down when aggressive (chemical based) cleaners are used. The most frequently used water-based polyurethane in the United Kingdom is Bona. Bona offers a wide range of incredibly high quality finishes that will stand the test of time. 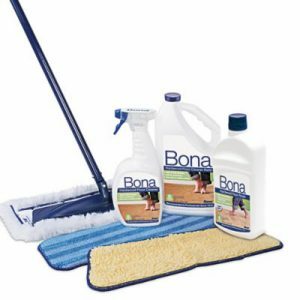 Bona also provides an everyday cleaning kit which we recommend for regular use. Sweep or vacuum clean the floor before mopping to remove any dust or grit. Again, it is important to use a damp mop only. Preventing damage to your floor is most certainly the best way to go about maximising the life of your floor. As we mentioned before, gritty dirt and wood floors don’t go well together! Preventing grit from entering the premises will really help reduce wear-and-tear on your wood floor. Fine grit, however minute, causes abrasion on the surface of the floor which speeds up the wearing process. We always recommend the use of mats to reduce the build-up of grit and dirt at the premises entries and to avoid dirt spreading throughout the building. If you haven’t had your floor installed yet, it might be worth considering the installation of a mat well. This approach allows for the mat to be countersunk into the floor and prevents the mat from sliding around. Furthermore, if the underside of the door is close to touching the flooring when opening, you’ll avoid any obstructions when opening the door. Furniture, such as chairs, are another common cause for high wear. But we have good news! By fitting felt pads to the undersides of your further, you’ll easily avoid scratches from forming around areas such as dinner tables, or kitchen counters where bar stools are used. Which type of padding you choose is quite important though, because incorrectly fitted pads will eventually fall off and may result in your floor getting damaged. For furniture with wooded feet or legs, try to use the nail-in pads. These pads not only last longer, but are less likely to fall off over time. When using this type of felt padding, be sure to check them occasionally and replace them when they have worn through. If you don’t replace them before they wear through, the nail may become exposed and could do some serious damage. For metal or plastic feet, it’s best to use pads that can be cut to size to cover the largest area possible. Remember, the larger the pad the bigger the contact point, which translates to more stable and durable protection. Before fitting this type of pad, always use methylated spirits or turpentine to thoroughly clean the contact area. This will ensure a strong adhesion.